Malee Nature Lovers Bungalow is situated 77km north of Chiang Mai, close to Chiang Dao Cave and is easily accessible by public transport from Chiang Mai. Regular buses bound for Fang and Thaton leave Chiang Mai Chang Puak (white elephant) bus station every 30 Minutes. Get off at the Chiang Dao Cave sign at the junction at the north end of town, from here motorbike taxis (60 Baht) or in Chaing Dao yellow songthaew taxis (150 Baht) can be hired for the remaining distance to Malee's. 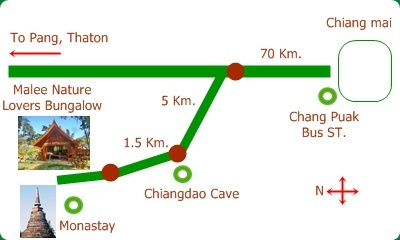 Alternatively Malee can arrange transport to and from Chiang Mai. Reservations are strongly recommend during Nov-Feb, but especially during Christmas and New Year when Malee's is often full.